For more than 25 years managers, professors and other speakers use PowerPoint to illustrate the content of presentations. But how did the software develop to its’ current stage? 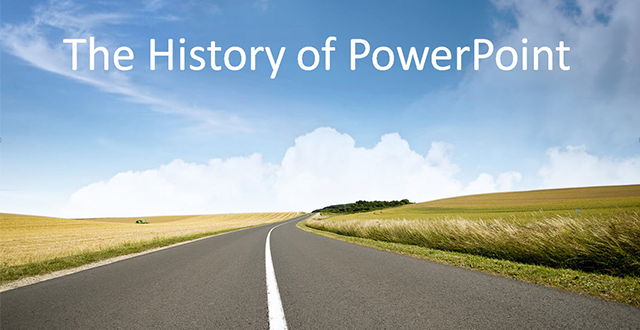 Let’s take a deeper look at the history of PowerPoint. The original idea was to simplify the creation of charts for overhead projectors. But this original objective transformed quickly to a software, which now provides the ability to display presentations from the laptop. In April 1987 Robert Gaskins and Dennis Austin published the presentation software PowerPoint, previously called “presenter”, for Mac. Just in August of the same year, Microsoft absorbed Forethought Inc. and secured the rights on PowerPoint. Already in May 1988 Microsoft presented PowerPoint 2 and just one year later Win PowerPoint 2.0 also for Windows. In the following 20 years 12 versions of the now market leading presentation software were released. In case of this development the technical potential was improved step by step. Functions like “copy and paste”, which are nowadays taken for granted, were followed by larger sample boards or extended file saving options. But clearly innovation doesn’t have limitations. Many Add-ons, upgrades or downloading tools provide individual extensions for each user. Also PowerPoint 2013 brings lot of new features. For example the ability to create videos or to gain access to documents from all over the world via internet. Business would not be conceivable without PowerPoint in the daily routine. Analysts rate the global usage using to 250 million computers. People create several billion charts a year. It remains to be seen, which innovations we can expect in the future.